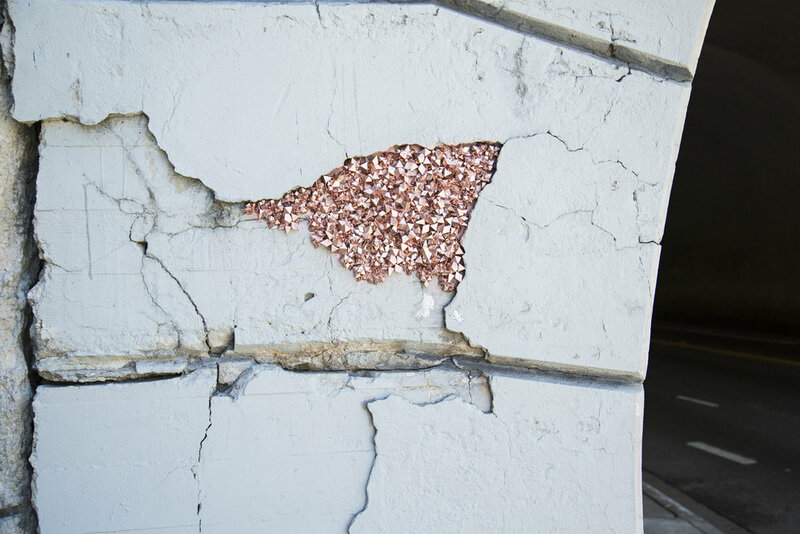 Urban Geode are sculptural crystalline installations exploding on the surfaces of our streets and growing from the crumbling infrastructure of our cities. Geodes are formations made and found in nature and my process of using manmade materials and placing them in major cities concurrently signals the tension between nature and industry and celebrates the beauty of urban space. Urban Geode is infused with a magical realism that encourages us to pause, to discover, to be present and to find beauty in the mundane. I draw inspiration and create my works in quiet, modest, tucked away spaces: the cracks in between bricks, the grating of a drain, the inside of a pipe and interior of a derelict phone booth. ‘Urban Geodes’ are created either of folded paper or individually cast resin and configured seamlessly to fit into spaces that inspire me. These installations are like hidden gems sprinkled across the world that invite us to actually look, to be playful and discover and to participate in a glorious and global treasure hunt. So far I’ve traveled to Dubai, Italy, Madrid, Bali, Philadelphia, San Francisco, Mexico, and Istanbul. Enjoy the images and feel free to hunt for the existing ones using this map of locations. I have also started a participatory art program in which you can install them in your own cities. There are successful installations all around the United States, and in Jordan, Turkey, Australia, S. Africa, Korea, Switzerland, and France. Stay tuned more more information as I make them available on the site! Geode "prints" are a series of limited edition resin cast prints from an authentic single limited production. They are produced using a rubber mold casting method, the original sculptures created entirely of folded paper. Approved, signed, and numbered by the artist, each design will be a unique creation by the artist. To ensure the integrity of the editions, all originals will be destroyed during the process of print creations (a natural occurrence). "Find beauty in the mundane."